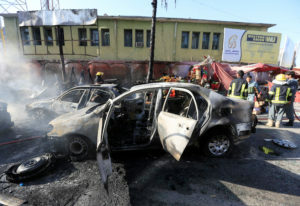 KABUL, Afghanistan — A suicide bomber targeted a group of Sikhs and Hindus on their way to meet Afghanistan’s president in the eastern city of Jalalabad on Sunday, killing at least 12 people. Gen. Ghulam Sanayee Stanekzai, Nangarhar police chief said that the attacker targeted the group on its way to the governor’s compound. They had planned to meet with President Ashraf Ghani, who was visiting the region on Sunday. Afghanistan’s tiny Sikh and Hindu minority has endured decades of discrimination and hostility, and today numbers only around 1,000 people. They have been targeted in the past by Islamic extremists. Afghanistan’s infrastructure has suffered from decades of war, and many rural communities do not have access to electricity or clean running water. Left: Afghan policemen inspect the site of a blast in Jalalabad city, Afghanistan, July 1, 2018. Photo by Parwiz/Reuters.